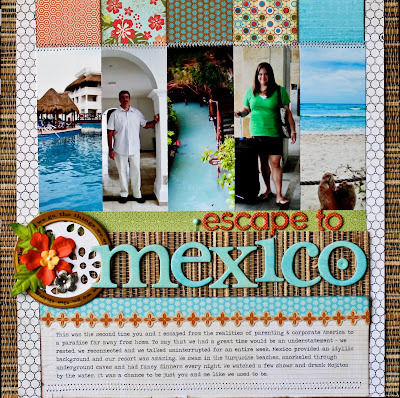 So here it is, my very first Mexico page. The memories are still fresh in my mind and I wanted to get out at least one page while I'm still coming down from our escape. This is a collection of some of my favorite photos and just a general roundup page. I'm sure there will be more to follow. The one funny thing that I notice about this layout is how huge and tall I look and how tiny my husband looks. Ha. In reality, I'm 7 inches shorter than him. I guess when I sized the photos, I didn't pay attention to scale. Note to self for next time! Supply list: The straw paper is something I've had in my stash for 5+ years, I think that Creative Imaginations made it. There's a little splash of Basics by BG and the rest is mostly LYB Pack Your Bags. The title is all Basic Grey...love those little orange letters. The circle chipboard is from last year's LYB Traveler line and the white eyelet paper I backed it with is from Making Memories. First up, is Catching Fall from Lily Bee Design. I love the colors and the fact that it can be used for anything - not just fall. And I usually don't do many flowers, but these are calling my name. This is my favorite of all the school lines so far. It's School Spirit from Crate Paper. Probably because I'm still doing preschool pictures and these icons and vintage prints are perfect! 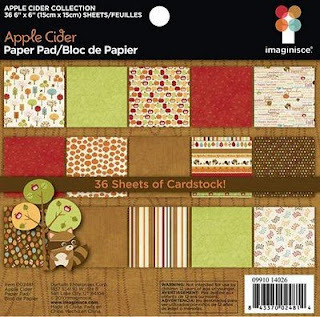 My two favorite themed fall lines are Apple Cider from Imaginisce and Maple Grove from We'R Memory Keepers. I love the colors and icons. I'm hoping that I can mix and match these two. They are great for Thanksgiving, apple picking, pumpkin patch, fall leaves and even my son's Thanksgiving play. 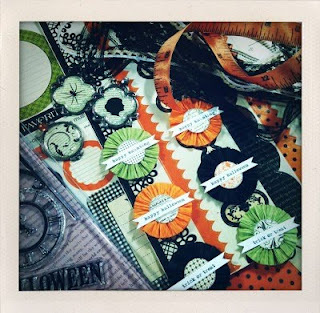 The Girls' Paperie Twig & Toil is one of my favorite Halloween lines so far. Very different patterns and embellishments. And Jenni Bowlin never disappoints. 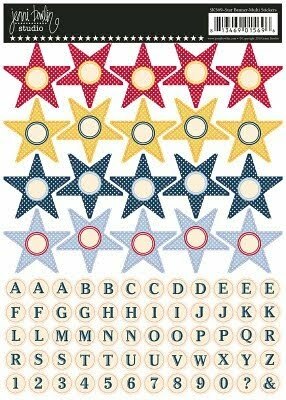 I love these stars and I can see using them on a ton of different layouts. I love the Alphabet Soup boy lines. I think the colors and patterns can be used for many different themes - not just boy or baby pages. I also love these playing cards. They remind me of the October Afternoon ones - just not vintage. And last but not least is Jillibean Soup's Pasta Fagioli line. Love the warm colors and funky patterns. I have no idea what I'm going to use it for, but I'm liking it. 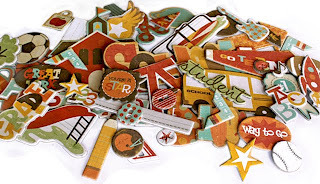 They also have great new canvas shapes and chipboard alphabets. 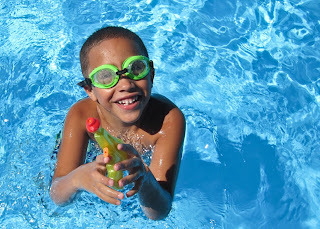 Can't get the pictures to post, but you can check it out here http://www.jillibeansoup.typepad.com/my_weblog/#tp. And so that's it, for now anyway. I'm waiting for Basic Grey and October Afternoon like a kid on Christmas Eve. If anyone sees a sneak, give me a holler! I was cleaning out my travel backpack the other day, when I came across this folded up, creased map of the Magic Kingdom. We must've carried it around all day on our last trip. I remembered how Nico kept asking me all day long "which ride is next, Mama?" and how adamant he was about riding more thrill rides and seeing less shows. Apparently, he wasn't familiar with my freak tendencies when it comes to touring Disney World. I've found over the years that if we get to the parks at rope drop and visit attractions in a certain order, there is no waiting on line since you're always ahead of the crowd. Doing it "my way" means that we get to see every main attraction and are out of the park by 2pm when it gets crazy & hot. Nicolas wasn't hearing that and I had to adjust my plans and expectations. Suddenly I had this little pip with opinions and demands. Ha. I gave in though, after all, these are his childhood Disney memories and I've already had plenty of my own. All of this paper is from My Mind's Eye So Sophie line (as are the red letters and the cool tickets). 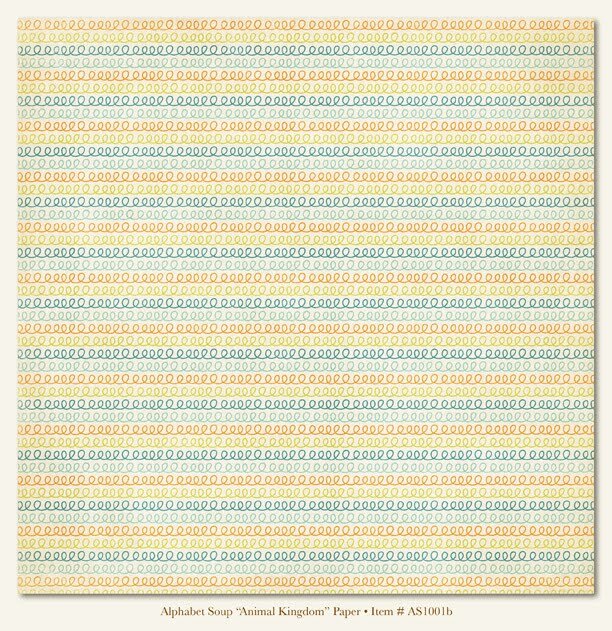 I included the map that inspired the page and also a list of Nico's favorite rides at age 4). I am in love with these fabric borders from Little Yellow Bicycle's Boardwalk line and I thought the red fabric circles went perfectly here. I think this is my current favorite page - because of the memory and the color scheme. Be back soon with Mexico pages! How can it be that a little over 24 hours ago, those were my feet overlooking the Gulf of Mexico? Sigh. We had a seriously amazing time. The beaches, the people, the resort...all wonderful. The resort was huge and sprawling. The landscaping was amazing. There were monkeys and iguanas everywhere. This was one of my favorite views. We spent a day at Xcaret natural reserve. We actually snorkeled through this river, in underground caves and natural pools. It was my favorite thing we did all week. I felt like I was in an episode of "Lost." See that little hut on the left? That was OURS. We camped out there every late afternoon for a swim and drink. I'd by lying if I said the break wasn't great. So I'm back home, buried under a mountain of laundry and itching to scrap. With some luck, I'll be back Wednesday with a layout or two. It seems like lately when I get my pictures back, I get 10 shots of the backs of people's heads for every 1 smiling face shot. This family trip to the aquarium was no exception. I will do a regular, 2-page layout documenting our day trip but I also wanted to point out the "look at this, look at that" shots too. I love the shots of Nico with his grandparents and even the baby of the family's fascination with the aquarium. Most of the paper I used are from Imaginisce's Splash Dance line. I like how whimsical and colorful it is! All of the stickers and glitter letters are old Doodlebug stuff I had. I also used a Hambly overlay on top of the "word" paper. It reminded me of looking through portholes and I thought it went perfectly with the aquatic theme. The seaweed border is my favorite part of the layout. I freehand cut strips of different green papers and glued them to the back of the white strip of paper. I then gently bent and roughed up some of the edges for texture and added some hidden fish. This was a fun layout to make. This Fourth of July weekend was one of the craziest we've had in years. We started on Friday with my niece's cooking party, then a pool party, my sister-in-law's 30th birthday, fireworks on the lake and finally a BBQ with friends. Phew! We were exhausted, but happy and grateful that we have lots of family & friends nearby to celebrate with! Instead of making separate layouts for each of the events, I combined them into this one layout. I will do a separate page of my niece's birthday party, but it will center around her celebration and not the 4th of July. The title comes from one of my favorite old movies (Four Weddings & a Funeral) and it's exactly what it felt like - bopping from one house to another. 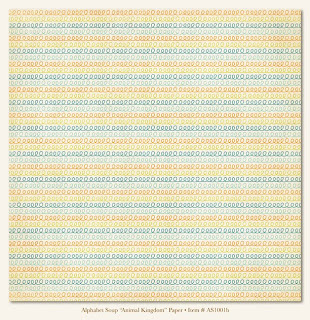 The color palette came from http://colorcombosgalore.ning.com/. There are some very talented ladies designing for this site. I love the examples and color schemes they come up with! All of the patterned paper is from We'R Memory Keeper's Old Glory collection (with the exception of the grid paper with is Basics by Basic Grey). 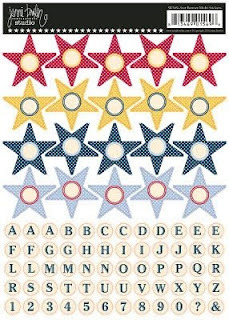 The letter stickers and blue star are Basic Grey. The days of the weeks are from last year's Little Yellow Bicycle Traveler line. I made the flag by cutting it out of a sheet of pattern paper (from We'R) and wrapping it around a toothpick. Finally, the tiny metal studs on the banner are Recollections. Thanks for taking a peek. I'll have an aquarium layout up towards the end of the week! We've been busy lately enjoying summer and the outdoors. The pictures are really starting to pile up around here! I scrap way less in the summer but I do try to make time to go through my pictures and write down stories and memories while they are still fresh in my old mind. I picked out a few of my favorites to share with you. These will probably be the next few pages that I'll sit down to do since I love the pictures. 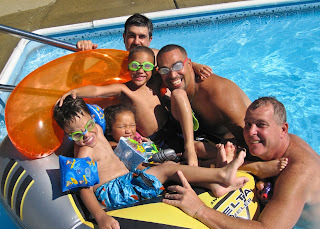 My niece turned 4 this past weekend and we had a pool party at my Dad's house. The purple and green Tinkerbell combination in this photo scares me. This is so NOT a combination that I've ever worked with before. I love the photo and the memory of our little princess in all her Tinkerbell glory though. 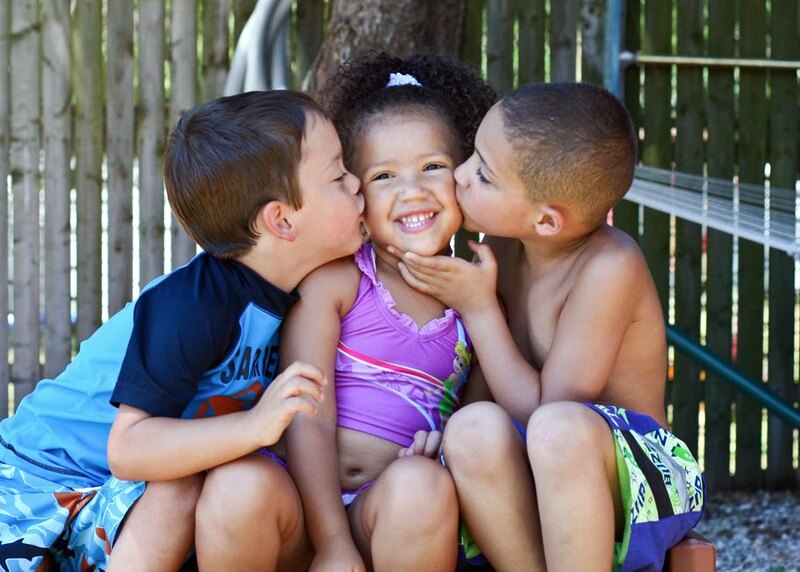 She is so very lucky to have both an older brother and an older boy cousin. They dote on her, give in to her whims and are fiercely protective of each other. I'm not sure if I'll include this shot in her birthday layout or do a separate one of her & the boys. Everyone in my family tends to gather at my Dad's on the weekends. Even more than usual lately since we've had a brutal heatwave in the Northeast. I love this group shot and can't wait to get my hands on some nice aqua and orange paper to go with it! 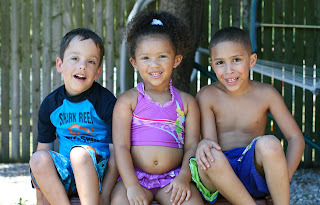 This is one of my favorite shots of the kids. I adore my niece and nephew. Couldn't love them more if they were my own. Nico is very close to both of them and this makes me happy. 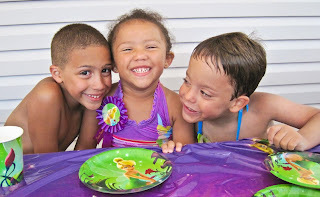 Even though he's an only child, he will grow up with cousins that are more like his brother & sister (just like I did). I can't wait to document this relationship. 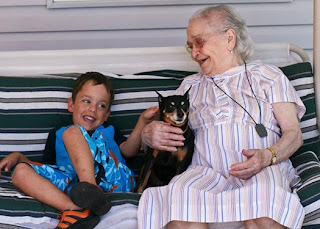 Oh and this is my FAVORITE picture I have ever taken of Nico and his great-grandmother. Technically, it's not a great photo, but I was able to capture the way she looks at him. He could do no wrong in her eyes and she adores him. It's the same way she's looked at me all of my life. This is a treasure for me. 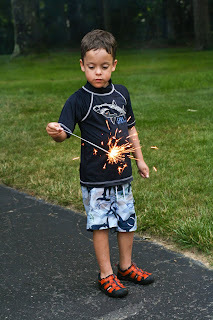 And last but not least, 4th of July. I'm working on a page about our whirlwind weekend. It should be up Tuesday morning! 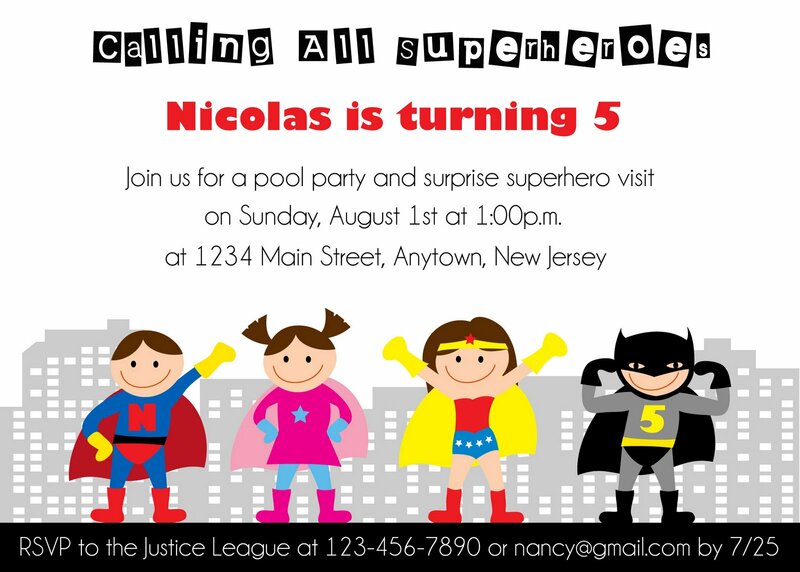 We are a little under a month away from Nico's 5th birthday party. 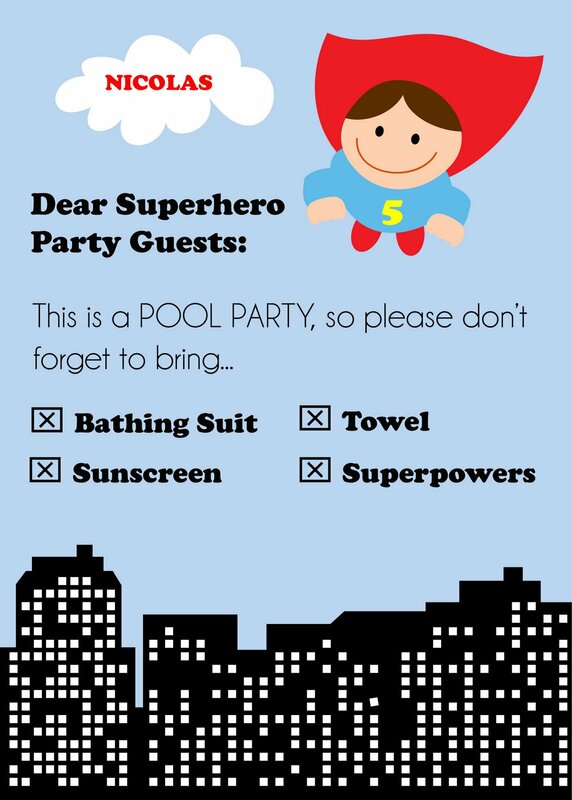 I am in full party planning mode right now and I just got the invites out. I thought I would share this cute invitation idea that I discovered. I purchased the image from a graphic artist on etsy.com! I ended up buying every single superhero image that she had and I plan to make my own goody bag labels and decorations. 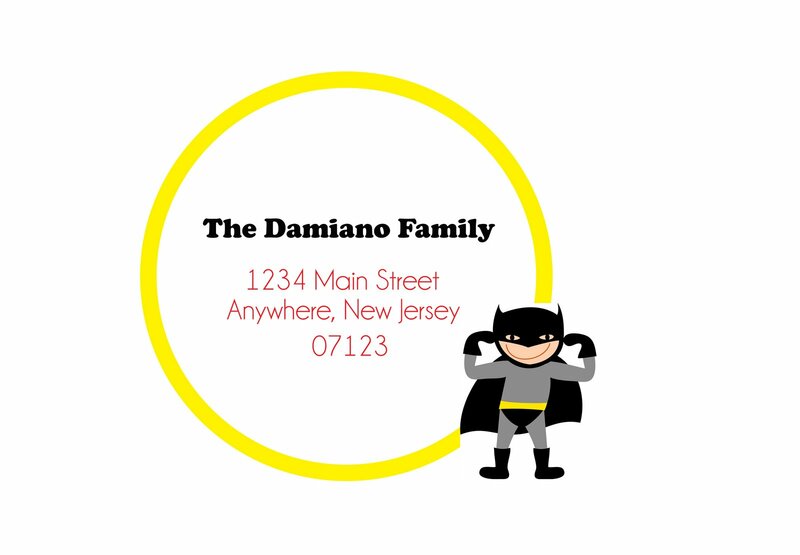 I used more of the graphics for this little 3x5 insert card to the invite. I was able to manipulate the image and add the "5" on Superman's chest. So cool! And lastly, the envelope. I added the yellow circle on my own and then layered the Batman on top. 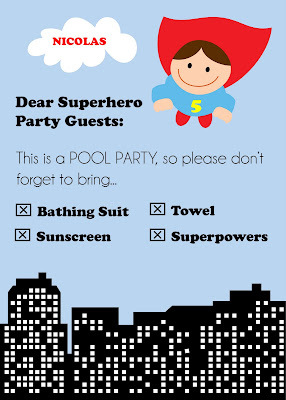 I think these make supercute custom invites at a fraction of the cost. Who knew you could buy graphic images on Etsy?! I'll share the rest of the party decorations and photos next month. 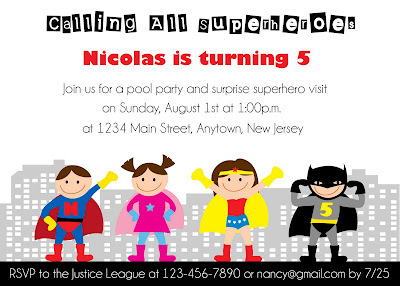 My little pip is so excited about his superhero party. Shhhh....he doesn't know it, but we've hired Batman to make an appearance. His reaction is going to be priceless and I can't wait. I'll be back soon with more summer layouts! My final three projects all made with the July Work in Progress kit. For more information and my interview, please visit http://www.wipkits.blogspot.com/. I'm the guest designer for the month of July. If you scroll down a bit, you'll see my post! I loved these sandcastle punches that were included in the kit. They are actually two separate pieces with small pop dots in the center. The brown ribbon was also included in the kit and I stitched it onto my layout with embroidery floss. The background paper is a specialty paper that I picked up at Michael's not long ago. I thought it was perfect for a "sand" layout. This layout is a combination of Echo Park (gingham & flowers) and My Little Shoebox (circle). I love these bright colors and thought they were perfect for a girly page. This is soooo out of my comfort zone since I never use pink. This was challenging! This is a mix of Jenni Bowlin (all of the pattern paper) and The Girl's Paperie (flags). I loved the bold colors in this palette. The numbers on this page reminded me of the boardwalk games that we play every summer. I've had these pictures in my pile for 2 years now and I finally found the perfect paper for them. I've had a whirlwind of a weekend and I'm just catching up. I'll post photos and layouts soon! This is a project that I made with the July Work in Progress kit. 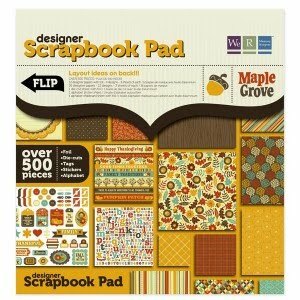 I love this kit - it's full of bright bold designs like the paper and stickers from Echo Park Paper Co. and lots of Jenni Bowlin goodies. I made 6 little flags as a play on my page title. I thought it was a subtle and different way to scrap the same theme park pictures that I take every year. The sticks are shish kabob skewers that I picked up at the grocery store. There are so many great Echo Park stickers in this kit. I am happy to say that I used almost all of them! I added some journaling right on the cloud because that bitty journaling spot wasn't enough space for my story. I measured the space, stuck the sticker on cardstock, aligned the text in Photoshop Elements and printed. Finally, I cut the sticker out and pop dotted onto my layout. My other project was this vacation countdown doorhanger that I made for my son. Since at 4-1/2, he has no real sense of time yet, he keeps asking me (daily) when we are going to the shore house. I made this so he has a concrete reminder of how much time we still have to go. Mind you it's almost 2 months away. He can't wait to put it up though! I loved working with this kit. Everything went together nicely and really motivated me to do some summery pages. I'll post 2 more projects tomorrow!